In the redbud tree, goldfinches ponder whether to come closer to the house. There is the birdbath. There is the niger feeder. There is Diane with her camera. Hmmm. 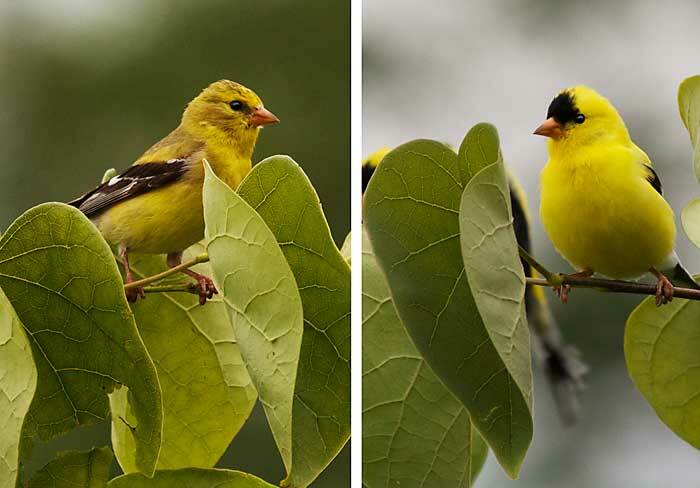 Now that summer is full on, Amerian Goldfinches are beginning their nesting cycle. They are wearing their bright nuptial plumage. The male, on the right, has a sporty black cap that is slipping down over his forehead. The female has no cap, and she wears a slightly more subdued shade of gold. They start nesting much later than most birds. It's because of the thistles. They wait for the thistles to be ready to provide rich, milky seeds. That's what goldfinches feed their young. It's unusual, because most songbirds feed insects to their young.